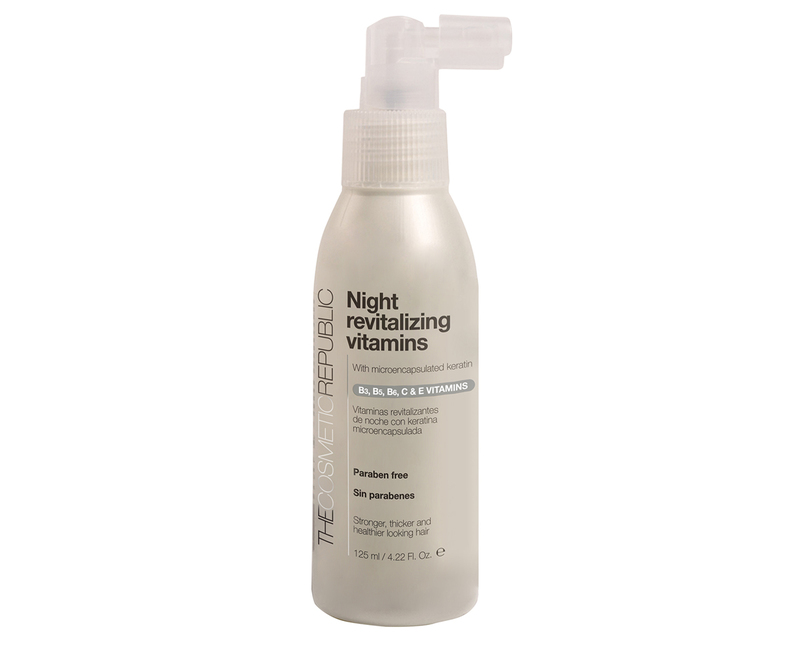 Specifically formulated for thin and weak hair, the Night Revitalising Vitamins are an invigorating solution for poor hair. Rich in trace elements, B3, B5, B6, C, E vitamins and keratin microspheres, they revitalize and promote the appearance of stronger hair during the night sleep. Its gentle formula works to restore and strengthen hair’s natural keratin structure. Strands are instantly nourished leaving you with healthy-looking, calm, manageable and smooth roots. Enriched with key ingredients such as sodium, magnesium, manganese, zinc and microencapsulated keratin for the specific needs of weak poor hair, these Night Revitalising Vitamins provide balance to hair’s body structure during the night sleep. Their exclusive formula nurture and strengthen hair from root to end, leaving it fuller and healthier looking with only a few applications. Respect scalp’s natural balance and provide the appearance of volume and shine to the hair. Does not leave the hair oily or sticky. Indicated for all hair types. Cold pressed. Paraben & sulphate free surfactants. Color safe. For men & women. Do not rinse. For best results use it every night before sleep. One of the most visible signs of aging hair is grey hair, but long before it appears, there is a degenerative process making hair stalks thinner and causing hair loss, among other consequences. Recent studies show that at the age of 35 hair starts aging, but in some cases this process may appear much earlier due to the daily life or the overuse of aggressive hair treatments & products. This Anti-Aging Total Repair is a natural blend of extracts that restores and revitalises damaged and aged hair over the years, due to stress, atmospheric elements or the excessive use of aggressive products, dryers and irons. This paraben and sulphate free surfactants Multivitamin shampoo with A, B, C, E & F vitamins and keratin microspheres has been specially designed for weak, thin hair and hair loss cases. Its formula provides shine, volume and strength to hair. It respects scalp’s natural balance while revitalizing hair stalks. A must-have for your every day beauty routine that will provide stronger, fuller and healthier looking hair. Cold press processed. The first laser hair treatment combining the most advanced Laser Therapy together with the Hair Booster Ampoules SAF100 PRO™, specifically formulated to fight hair loss, promote new hair stalks and obtain stronger, thicker, healthier hair. Home use version. Endorsed by doctors from all over the world. Without secondary effects, nor risks of any kind. Indicated for men & women above 18 years old. Hair Booster Ampoules SAF100 PRO™ do not contain minoxidil, do not leave the hair oily or greasy and they are fast and easy to use. Over the years, the diameter of hair becomes thinner and weaker. This Hair Thickener that defies time, restores and maintains a healthy hair appearance providing more volume to hair. A weightless lotion that will thicken the appearance of hair to create the feeling of movement and body. Fuller, shinier and healthier looking hair in 1,2,3. It transforms and volumizes fine hair from lifeless to lively, adding volume to fine limp hair. Infused with selected ingredients to bring back body, shine and manageability for healthy-looking hair.